Bluehost Packages – What Packages do Bluehost offer? Bluehost Performance – How good is the performance of Bluehost? Bluehost Support – What support can you expect from Bluehost? For over fifteen years, BlueHost has made a name for itself by providing a low-cost solution that delivers for its customers. Bluehost has been rated as a mid range web hosting provider. BlueHost started their operation in 1996 and is located at Utah, USA and now has become one of the biggest web site provider. Most small business owners, freelancers, and entrepreneurs want a web hosting solution that will provide them with the tools they need to develop a customizable site without spending a lot in time and money. Since 1996, BlueHost (www.bluehost.com) has been helping individuals and businesses easily set up customized domains and web pages with little effort, time, and money. According to founder Matt Heaton – when Bluehost launched in 2003, they had 55 signups their first month. As we write this post, Bluehost is home to more than 2+ million websites. Bluehost is now owned by Web Hosting Giant Endurance International Group (EIG). Bluehost have 4 VPS plans – standard, enhanced, premium and ultimate VPS plans. The most popular is the enhanced VPS plan. This plan comes with a speed of 2 CPU Cores, storage space of 60GB, a 4GB RAM and 2TB bandwidth. It also includes 2 IP Addresses and 1 domain. Unlimited web hosting space & unlimited bandwidth transfer – Bluehost provides an unlimited amount of space on their servers at no additional cost to the consumers. Unlimited domain hosting – You can host as many websites,blogs sites on a single Bluehost hosting plan. Web hosting Applications – CPanel with Fantastico & Simple Scripts installer. 400+ Apps like WordPress only requires one click for installation. Bluehost provides the easy to use cPanel Control Panel. The cPanel control panel has easy to use graphical navigation and icons. Customers who would like to try before you buy will appreciate the Bluehost cPanel test drive that is offered to BlueHost visitors. Here, you can click on the link to their demo site and see how their tools work. Bluehost Reliable and Trustworthy: the company has a very long history of almost two decades. BlueHost has had an occasional outage here and there, but nothing of a significant duration. While no company is ever going to be one hundred percent free of malicious attacks or server downtime, it is worth noting that no significant data losses, security breaches, or server outages could be traced back to BlueHost as the cause, unlike many of its competitors. BlueHost has built its own data centers, its own servers, its own national fiber network, and its own Linux code. Bluehost has an industry leading 6 worldwide datacenters. BlueHost customer service is located at Utah in the United States and they have round the clock support for any complaints or queries from their customers. Because everything is developed in-house and kept in-house, BlueHost does not have to rely on third parties to help its customers fix problems – they handle every aspect of the hosting solution for its customers. They provide 24/7 customer support via live chat, phone, or email so that customers can have several options when contacting them. In a situation where you are having difficulties with something, their technical support always responds swiftly to provide solutions to their problems. Despite a large customer base of over one million domains, BlueHost prides itself on short wait times (under a minute on average) and high customer satisfaction (often surveying customers after the fact to ensure quality). Furthermore, BlueHost makes reference guides easily available, by providing startup guides to its customers regarding the building of web pages and the management of domains, sub-pages, e-mail accounts, and transaction development. There are also many items available under its “Knowledge Base” page, written by both BlueHost personnel and BlueHost super-users to provide help to customers who are trying to figure out their own business model and online model. Videos are also available on the “Video Tutorials” page, which can walk users through certain steps in the web development process. That’s a lot of support to get right off the bat, when new entrepreneurs and small business owners need it the most. After testing Bluehost, we have identified the most important Pros and Cons. For a new customer, Bluehost.com will offer a Free Domain with a new web hosting package. The domain will be free for the 1st year and then you have to pay the standard Bluehost domain renewal fee each year (approx $12-15 a year). WhoIsHostingThis users rate BlueHost as 3.5/5 – Very good. You get one free domain name just by signing up with BlueHost without paying any additional charges. You save ten dollars every year while you have the account with Blue Host! It is very important to look for a webhosting company that offers anytime money back guarantee in case something goes wrong with your webhosting. Does Blue offer Free Website Transfer? Bluehost also provides Google credits for AdWords that is valued at $200. This AdWord voucher will allow you buy $100 worth of advertising marketing with Google. Bluehost has been rated as a mid range web hosting provider. 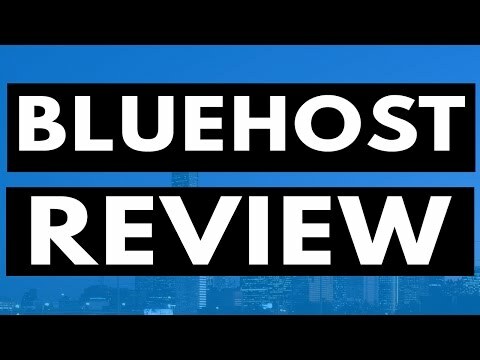 Blue host remains my go-to choice when it comes to hosting websites for my clients. I quickly engage in live chats with the support team whenever I have issues with my hosting service. Any web developer can attest to the fact that a developer needs quick access to the hosting’s support team in the case of technical issues. Live chat support is essential as email and phone support are slow. As Bluehost has millions of customers, in our experience the bluehost live chat response time can be slow. Better to go a for mid sized web host with fewer customers. Then the support resource will be quicker? Hmm maybe ?. The support from Big providers like go daddy and bluehost seems to be longer. In our testing inmotion and SiteGround support is very fast.